As the metagame continues to adapt to the recent additions of Bloodbraid Elf and Jace, the Mind Sculptor, we have seen lots of the expected: Bloodbraid bolstering Jund, and Jace slotting in nicely as a finisher for controlling blue decks. Temur Midrange was also a concept that was bandied about, and is currently seeing play. However, something else has happened: a variety of more surprising decks have taken these cards out for a spin and experienced success. Some of the new Bloodbraid and Jace shells required little alteration; others have demanded more significant tweaks. This article explores some of the more unexpected homes for Bloodbraid Elf and Jace, the Mind Sculptor, and provides some anecdotal accounts of how the format has responded to their incorporation thus far. 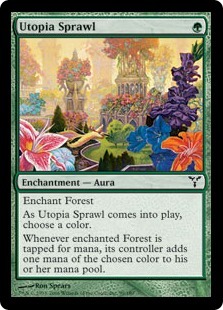 We’ll start with a somewhat under-the-radar home for Bloodbraid Elf in Naya Zoo. While the Elf was originally banned for the threat it presented in Jund strategies, it also has a storied history of being included in more aggressively slanted Naya decks, going all the way back to its time in Standard. While I think that this sideboard is still very much a work in progress (for example, I would really like to see some number of Fiery Justice to address faster creature decks), I do like the premise of pairing Bloodbraid Elf with its onetime Standard teammates in Wild Nacatl and Knight of the Reliquary, and then tacking on a ton of burn and a variety of top-end creatures. The deck gets to be aggressive with one-drops, but can also play a grindy game as needed. Cascading into something like Tireless Tracker is a play that many opponents are ill-suited to keep pace with, as the tandem represents an enormous amount of potential card advantage as well as pressure. As the deck’s 12 aggressively inclined one-mana creatures suggest, this strategy lives and dies by how fast it comes out of the gate. In that context, Bloodbraid Elf is a hasty curve-topper that can sling a burn spell or find another body, and as such fills the closer role and complicates enemy stabilizing. Looking closer, I am a fan of the sideboard Thoughtseizes, as they address the strategy’s classic weakness to combo. I also like the addition of Lingering Souls in the deck’s sideboard as an ideal cascade hit against grindy decks. I’m unsure the deck wants that many copies of Grim Lavamancer, but overall the deck looks well-suited to putting relentless pressure on its opponents. We’ll next examine a deck that has put up competitive results in the past, but is incidentally boosted by the return of Bloodbraid Elf: RG Ponza. Ponza is reliant on early accelerants to power out land destruction spells and delay its opponent’s development; then, it ends the game with fatties cast ahead of schedule. It has sometimes faced the problem of drawing lots of disruption but no way to actually close the game, or investing lots of card capital in accelerants, and then running out of gas in the midgame. An unanswered accelerant into Bloodbraid-finding-Blood Moon spells lights-out against many decks, and even Molten Rain or Stone Rain can potentially set opponents far behind. As with Naya Zoo, Tireless Tracker makes for a potent tag-team partner with Bloodbraid Elf. I saved the spiciest morsel for last. The most intriguing deck to benefit from these unbans is a unique deck known as Taking Turns. This strategy toiled in the shadows of the format for quite some time, until Daniel Wong broke through with it in spectacular fashion at last year’s Grand Prix Las Vegas. Despite this great result, the deck is still fringe. 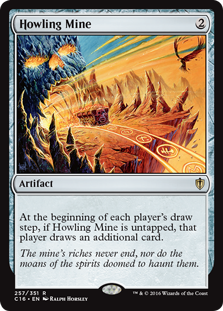 My theory on why this is the case is that the traditional draw engines for the deck (Howling Mine and Dictate of Kruphix) are lousy cards on their own, for several reasons. Foremost is their symmetrical nature; while Turns mitigates that once it gets going, it also makes deploying them early more risky. This problem is compounded by the fact that in order to go off, the deck usually needs these cards in play; that means they occupy a spot in the curve that could otherwise be used on interaction to prevent the deck from falling far behind, as can sometimes occur against aggressive strategies. Lastly, Mines make for weak topdecks when playing from behind, or while fishing for a closer. This list in particular borrows heavily from the mono-U build of Living End that made waves recently; As Foretold solves part of the mana bottleneck issue that can sometimes impede Turns from getting fully untracked, and with Ancestral Vision makes for a powerful card advantage engine. Living End as a one-of searchable boardwipe to shut down aggressive strategies (and sometimes recur Snapcasters expended to block) also seems good to me. Last but not least, Turns is as natural a home for Day’s Undoing as there is in Modern; an emergency refill can go a long way in keeping the deck from fizzling. I’m not entirely sure how I feel about the sideboard (splashing white for those cards seems a bit dodgy), but the deck otherwise looks like it has heaps of potential. You’ll notice that I devoted significantly more space talking about decks leveraging Bloodbraid Elf to good effect than I did discussing ones on Jace, the Mind Sculptor. This is by design, as I feel that thus far, the Elf has proven to be the more versatile card for deckbuilding purposes. While Jace’s potential is self-evident, this potential can only be realized in a specific shell, which is a blue-based deck that can prevent the planeswalker from being cleared by attackers or a well-timed Lightning Bolt. Outside of this context, Jace ends up being the combination of Brainstorm and Healing Salve far too often, which underwhelms for four mana. Supporting Jace effectively isn’t trivial given Modern’s tools and conditions. Bloodbraid Elf is easier to accomodate, as it only requires that its home have some nice three-mana spells to cascade into and benefit from deploying extra resources quickly. While the quality of this benefit is somewhat indeterminate, certain deckbuilding concessions ensure that Bloodbraid crashes its way onto the battlefield ahead of schedule, has a quality selection of three-drops to cascade into, or both. That said, the card has not felt unbeatable; while it certainly does a lot for its cost, at the end of the day, it’s a grounded creature with an average body with a somewhat random effect. Good? Certainly. Great? Perhaps. Format-defining? I wouldn’t say that. Overall, I actually have to say that Bloodbraid has been more impressive relative to my expectations. Of course, Jace was saddled with hype, as there was plenty of speculation regarding the fate of Modern after its unbanning. However, neither of the cards has felt to be “too good” for Modern thus far, which is a credit to Wizards for making what was by all accounts a gutsy move. Anecdotally, I haven’t seen a noticeable dip in format diversity, and have instead seen a plethora of interesting decks that have either incorporated Jace or Bloodbraid, or devised a strategy to combat them effectively while still remaining viable against the field. So far, so good! Modern has seemingly survived what some feared would be an apocalyptic shake-up, and I for one intend to get my fair share of matches in for what has been a quite enjoyable format thus far. If you have any sweet BBE or Jace decks that you’d like to share, or if you’d like to give your impressions on how those cards have affected Modern, drop me a line in the comments.